Hello Everyone! My name is Lyndsey, and I teach middle school ELA. I also share resources at my TPT store, Lit with Lyns. I’m super excited to be a guest blogger for Performing In Education! 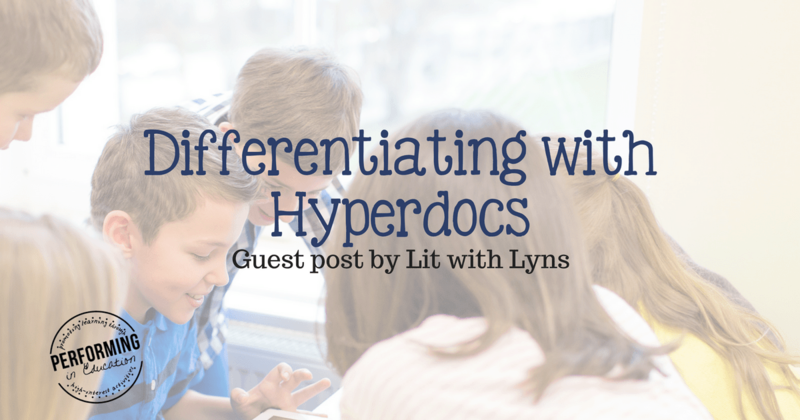 I’ve really been looking forward to giving you more info about Digital Differentiation using Hyperdocs. According to The Hyperdoc Girls, “Hyperdocs are a transformative, interactive Google Doc that replaces the worksheet method of delivering instruction.” Hyperdocs allow students to work at their own pace while completing each of the activities and take the focus away from the teacher, promoting student-centered learning. To give you a better idea of how to implement this, I’m going to go through the process I use when creating my hyperdoc resources. Look at the standards that you need to teach, and then determine what methods you want to use in order to ensure students master these skills. I determine what skills my students should know by the time they complete the hyperdoc activities. I follow the Engage, Explore, Explain, & Apply structure when creating my hyperdoc resource. Using this model, I typically include approximately 6 activities total. Engage– I start by engaging students at the beginning of the lesson with a link to a video that introduces the topic that will be discussed. For example, if I wanted my students to understand point of view and how different points of view can change a story, I may include a video here that simply provides a brief intro about each type of point of view. Explore– This is where you include links to articles, videos, infographics, etc. that allow students to explore the topic. Sticking w/ the point of view topic, this is where I would pull from a variety of different online texts and tools, where students would be exposed to different points of view. I may also include questions on the Hyperdoc that I create to go along with the text, and they answer the questions directly on their doc. That way, I can keep track and provide feedback as they complete each task. Explain– At this point in the lesson, students will take a more in-depth look at the skills they are learning. To further explain point of view, I would post a link to Edpuzzle.com where they watch a video and answer questions, which requires them to identify the different types of point of view that’s used throughout the video. I may also have students use digital task cards, where they would read an excerpt from a text, and then identify the point of view that’s being used. Apply– To apply what they have learned, I might have students to create a collaborative story that shows their understanding of point of view, using a tool such as Google Search Stories Video Creator. This is a YouTube site that lets you create a digital story out of a series of Google searches. Another choice would be to include a link to a quiz created on Google Forms. My class recently started a unit we call, “Washed Away,” which is based around realistic fiction novels about Hurricane Katrina. Within this unit, students would be reading a realistic fiction novel called, Upside Down in the Middle of Nowhere by Julie T. Lamana, which is about a family who experienced Hurricane Katrina. I knew that my students, being 11 and 12 yr olds, weren’t very familiar with the impact that this hurricane had on those that went through it. With this in mind, I decided to begin the unit with informational texts that addressed this. It was also a way for me to include nonfiction articles, since the novel they would be reading was fiction. This is a great way to promote critical thinking skills, and they were able to work through each activity at their own pace. You may also choose to let students work in pairs or groups. Since hyperdocs are normally done on Google Docs or Slides, 1 student can share the doc with the other group members. That way they’re all working on the same document. I typically assign the hyperdoc activities through Google Classroom. However, you can also share this with students via your Google Drive account, Edmodo, by posting a link to your website, or using another digital program. You can access a FREE video on how to assign in Google Classroom here. I hope this post encourages you to try hyperdocs or another 21st century learning tool! This has totally adapted the way I teach. It also shows that even after 13 years of teaching, there are always ways to grow and learn as an educator. To see more of my tips and resources, visit my blog, Lit with Lyns! Making Financial Literacy Connections: A Must-Try App!